The Perth Wave Energy Project consisted of three 240 kW CETO 5 wave energy converters that were installed and grid connected in late 2014/2015. CETO is a fully submerged, pump-based technology whereby a submerged Buoyant Actuator moves with the energy of the ocean’s waves, 1-2 meters below the surface of the ocean. The Buoyant Actuator is attached to a pump via a tether, and the entire system is moored to the seabed. As the Buoyant Actuator oscillates with the wave motion, it allows the pump to extend and contract propelling high pressure fluid ashore via a subsea pipeline. The high pressure fluid then powers an off the shelf hydroelectric turbine to generate clean renewable electricity. De-energises fluid is then returned via a second pipeline at low pressure, forming a closed loop system. The CETO 5th generation devices operated for 12 months through 2015, over four seasons and accumulated over 14,000 hours of in-ocean operation. Power was sold to the Australian Department of Defence under a PPA. In addition a wave energy (hydraulic) powered desalination system was connected and operated, again with potable water produced and sold to the Department of Defence. Garden Island, Western Australia, home to HMAS Stirling, Australia’s largest naval base. The Perth Project is now being partly decommissioned ahead of deploying a larger capacity CETO 6 pre-commercial array further offshore that will connect back to Garden Island. CETO 6 is larger than CETO 5, offering up to 1 MW output per unit, and incorporates the power generation offshore, inside the buoy rather than onshore as with the current CETO 5 generation. Carnegie is developing a 15 MW CETO 6 commercial array to be delivered in two stages at Wave Hub in the United Kingdom. Stage 1 will see the deployment and grid connection of a single CETO 6 unit at Wave Hub in 2018, and is supported by a £9.6m of European Structural Investment Funding (ESIF) and private investment from Carnegie. The Perth Project was financed by Carnegie private shareholders, Western Australian LEED funding and Australian Renewable Energy Agency (ARENA) funding. 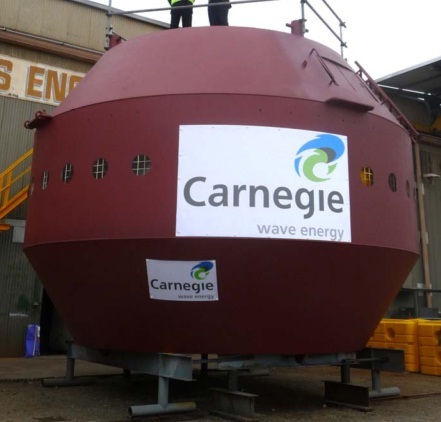 In July 2012 Carnegie signed an agreement with the Australian Department of Defence to develop the Perth Wave Energy Project on Garden Island and provide power under a power supply agreement. In December 2012 Carnegie received environmental and maritime safety approvals from the State government and Department of Defence following detailed environmental impact assessments and extensive community consultation – both finding the Project would not have any significant negative impacts on the environment. Garden Island has significant natural landscapes and high natural heritage values. Its flora and fauna is important and scientifically diverse and includes some rare species. Assessment of potential environmental impacts resulting from the project, together with mitigation and management measures to minimise harm to the environment, were reviewed by Carnegie and specialist environmental consultants in consultation with the Western Australian Environmental Protection Authority, Defence and other key stakeholders. Overall, the project has been assessed as having relatively low potential risk to the wider environment, with no high or unacceptable risks or potential impacts remaining after management. The Marine and Terrestrial Environmental Management Plans identify, mitigate and manage all activities related to the project and its potential impacts. Carnegie will be carrying out additional environmental monitoring and assessments during all stages of the project to ensure effective management is maintained. Perth Wave Energy Project is located in Australia.